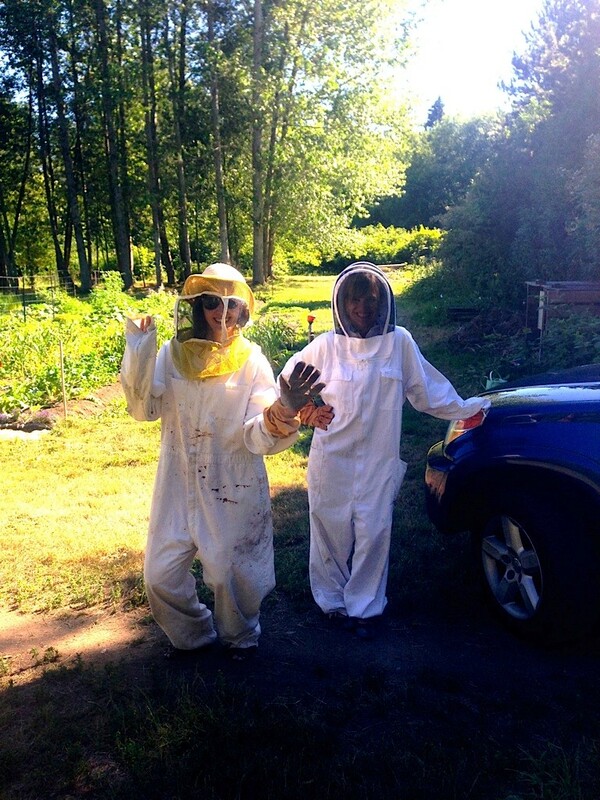 Bee IPM Bee Keepers and Bee Breeders: Heather Higo & Liz Huxter. 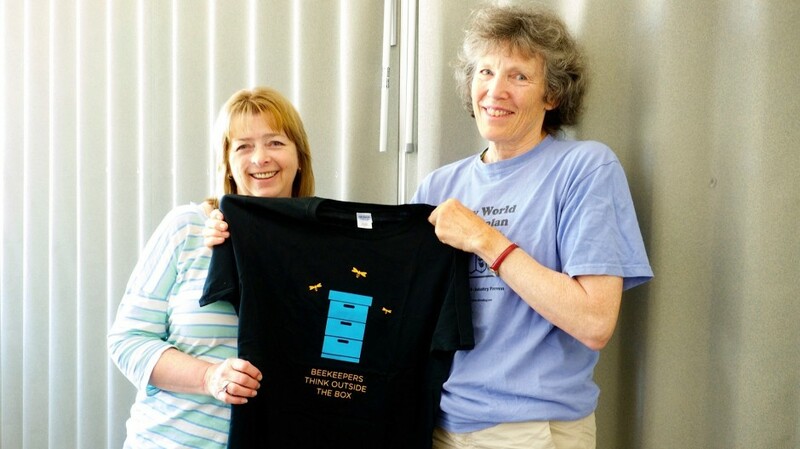 The Ontario Beekeeping Association t-shirt that reads “Beekeepers think outside the box” was a timely gift of appreciation from Heather to Liz. Marta Guarna, Bee IPM Scientific Director, reports kicking-off a study that will look at the sub-lethal effect of pesticides on honey bees’ natural defenses against pathogens. The project is a collaboration between the UBC team led by Leonard Foster with Dr. Jeff Pettis of the United States Department of Agriculture (USDA) and Liz Huxter of Kettle Valley Queens who is assisted by Jamie Lee Martin, g.e@ubc newest student intern. Dr. Kelly Butts, UBC neuroscientist, will lead the implementation of the first set of experiments, sponsored in part by the Eastern Apicultural Society (Read funding announcement here). 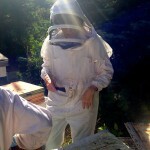 Jamie Lee Martin, g.e@ubc Intern, learns from experienced beekeepers Liz Huxter & Heather Higo. 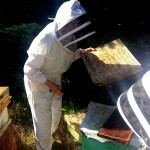 On July 8th, Liz Huxter with the assistance of Jamie Lee Martin, g.e@ubc newest student Intern, transported colonies of honey bees that are high in Hygienic Behavior (HB) from Grand Forks, BC to the UBC Farm to initiate this collaboration. ‘Hygienic Behaviour’ is a social immunity trait that helps bee colonies defend themselves against pathogens. 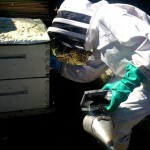 It involves identifying and removing infected or dead larvae from brood frames. 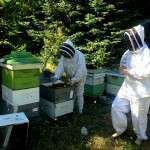 The colonies will be used by the research team to study the effect of sub-lethal concentrations of pesticides on HB. 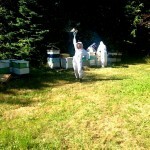 It was quiet at 3:00 in the morning at the UBC Farm, when Liz & Terry Huxter and Marta Guarna arrived to the UBC Farm to drop off the honey bee colonies with the assistance of Chris Aloise. 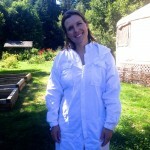 “I saw a group of people dressed in white overalls arrive in a trailer in the middle of the night, at around three in the morning. They got off the trailer and run towards the farm to open the gate. I didn’t know what they were doing. When they parked, they begun unloading what looked like boxes” explains one of the UBC Farm’s caretakers. As she described what seemed like an alien scene from an X-Files episode, we (Andrea Lloyd and Zaira Petruf from the genomics.entrepreneurship@UBC team) were handed two of the so-called ‘science fiction white overalls’. 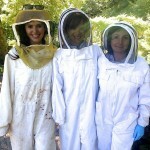 “You will need to wear these if you are planning to come close to the bees today“, Marta from the Bee IPM team warns us. 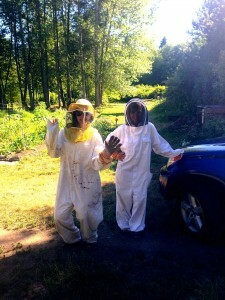 We decided to keep our fear of bees to ourselves and embarked on an adventure…all to support the team’s efforts to improve the health of these important pollinators. 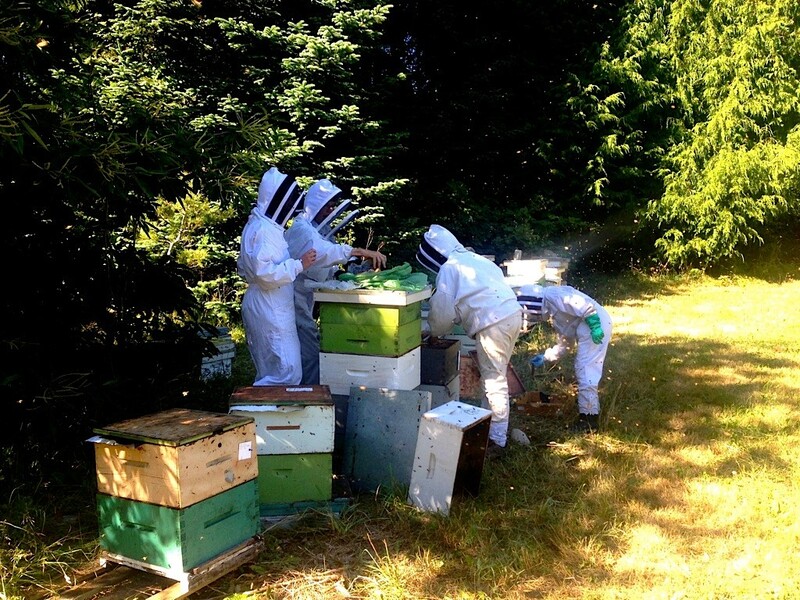 Liz Huxter, Marta Guarna, Heather Higo and g.e@ubc Intern Jamie Lee Martin fed and soothed the bee colonies after their relocation to the UBC Farm.